It’s been a while since I posted anything here, but rest assured my little elves are hard at work on goodies for you. Here’s an update. The 15th anniversary edition of my first novel, The Organ Donor, is on track for a November release from Bloodshot Books. I went all self-indulgent with this one, penning a 6,000-word afterword for the new edition, laying out the whole sordid story about my real-life encounter with Chinese organ trafficking. The publisher hired the estimable Deena Warner to do the cover art and design, which I hope to show you soon. I’m again working with filmmaker John Johnson to foolishly spend any royalties I earn from this edition on a fun book trailer. (Watch past book trailers at this link.) More information about The Organ Donor. The what?! What ‘chu talkin’ about, Willis? That’s right; there’s another novel in the sausage-making factory. This one is a trunk novel, a ghost story about the Civil War, Ku Klux Klan, and ugly racial violence. As if that’s topical. I enjoy reading/performing stories, so I’m trying something new: recording my own audio book. It’s been a fun experiment so far but fraught with frustrations as my basement office isn’t exactly a sound booth (chugga-chugga laundry machines behind me, and idiot felines scratching on my window screen), and my microphone picks up every breath pop, inhalation, and squishy lip parting that I make. Probably the most successful aspect of this venture will be the blooper reel. There’s also the challenge of keeping character voices distinct. My main character is a Southern belle who alternately sounds like Scarlett O’Hara or Matt-Warner-forgetting-his-character’s-voice. But when it’s done, I nevertheless intend to release it on the Amazon ACX platform and possibly on Youtube. If successful, it will make one long car trip bearable for you. Listening to an audiobook really is the best way to travel. And on the personal front . . . The website design business keeps the “busy” in business. I mean, day-um. Deena Warner Design continues to be in high demand for author websites. I’m also spending a significant portion of time working for First Arriving, a marketing firm in high demand for fire department websites. My writing career currently occupies the 530-630am hour most weekdays, and these two firms occupy everything else — that is, everything not taken up by my high-energy 6- and 8-year-old boys, who are scary smart. On top of all that, I’ve become ever more entrenched in Total Defense Martial Arts, which provides boxing and Brazilian jiu-jitsu instruction to the Staunton area. Starting in January, I’ll assume primary responsibility for teaching BJJ to kids between 6 and 16. I’m also in talks with Staunton Montessori School to volunteer for two months as a self-defense instructor to 7-9th graders, teaching them the joys of escaping headlocks, bear hugs, and chokes. That’s about it. Please stay tuned for all the happenings this fall. What, nothing about the election this time, Matt? That’s right, I’m here to make you happy! Three quick items. We also are fortunate to be able to feature Matt’s better half, the multi-talented Deena Warner, who will be doing the cover art. 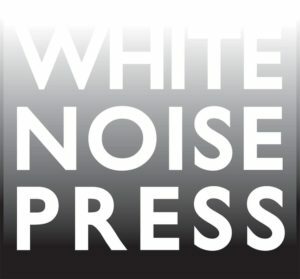 On the way from White Noise Press! Deena’s collectible Halloween card is in the mail. 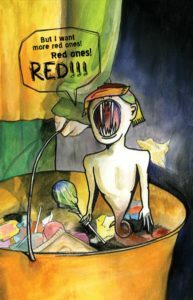 It features a story by Monica J. O’Rourke as disturbing as Deena’s illustration. This has been an annual tradition for 15 years. Deena’s M.O. is to draw or paint something and then invite someone to write a story based on it. I wrote “Life Insurance” for her in 2005; you can read it in Dominoes in Time. The card is free; just sign up to get one next year. Over at Deena Warner Design, we launched a major website for Richard Chizmar today. Another major website launches this week for another well-known author. I can’t say who it is except he strongly resembles Santa Claus. We have a special going on for economically priced websites, you authors and publishers out there. So I’ve just spent the past two days pulling my hair out reprogramming this website’s CSS file. The good news is Google’s Mobile Friendly Test says I now pass the grade. To experience the awesomeness for yourself, just grab the right side of your browser window and slowly make it narrower. Consider this your PSA to get your website affairs in order by April 21! I have visions of Google secret police breaking into houses everywhere, cackling maniacally, as they scream about CSS armageddon. Yeah, it could happen, you know. The goes with my last post. I’ve collected links to some of my non-fiction articles that are still available as free reads. Enjoy! I’ve collected links to some of my short stories that are still available as free reads. Aren’t I generous? Most are audio adaptations. Enjoy! I’ve resurrected my Mad Libs-style game from the Horror World days. Click below to play, and enjoy! My YouTube channel (finally organized!) has a bunch of my stuff aggregated in one place. Enjoy. You Sank My . . .
From the I Am Secretly A Geek Department, today I launched an online player-versus-computer Battleship game I programmed myself. Click here to play. It began a couple years ago. I had a great time making the Haunted House Adventure, a puzzle game set in my home, and wanted to try something else. Deena one night suggested we play a pencil-and-paper version of Battleship to amuse ourselves, and that’s when I wondered if the experience could be duplicated online. I gave up on a player-versus-player version after a couple months. While I had a member-management system in place and dreams of turning it into a Facebook app, there were two fundamental problems. First, it wasn’t completely hack-proof. How could I safeguard private user data and prevent people from cheating? Second, people would get bored playing online Battleship as a turned-based game unless they were both online at the same time. So, I put it down until this year, when the idea came up of programming an artificial intelligence to play against. 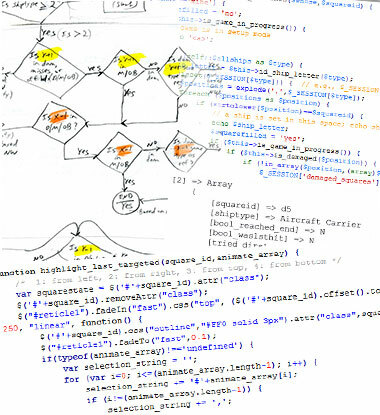 From there, I learned things like the value of using flowcharts to work out boolean logic before ever laying down a single line of code. I don’t have a good answer to the question posed above. Why spend time on something like this? Sure, it has collateral benefit to Deena Warner Design in that I’ve sharpened my object-oriented-programming skills. But this wasn’t “writing” unless you consider programming to be writing. Well, I don’t like leaving things undone, for one. But it was also fun. Why spend time on any creative project in which creation is the only point? The pleasure of making something for the making’s sake is an attitude I hope to cultivate in anything I build, whether it’s writing-related or not. Exciting news from my other job as a partner in my wife’s business. Last week, we launched a revamped website for author George R.R. Martin to synch with HBO’s premiere of GAME OF THRONES, season 3. Maybe soon we’ll get around to redesigning our own website.